Back to basics tip #15: As I go through the kids’ clothes pulling out their summer stuff, I always go back to look at the smaller sizes. Not so much to reminisce, but to pull out the pants for Kaye to wear as shorts. My Kaye has a small waist size. 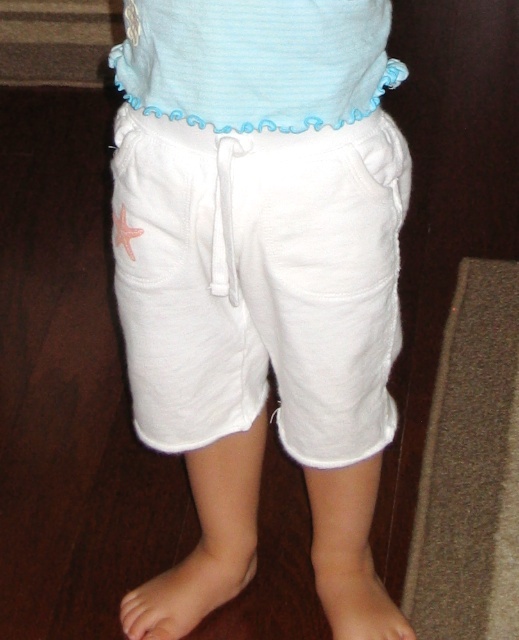 So I am able to pull out 9 months pants for her to wear as shorts or capris in the summer. Cute!!! What a great idea. My daughter will be 2 next week, and she can still wear the tiniest sizes in the waist! I may have to see if I have any of her older pants left that I can use this way!! Thanks for the idea! I do the same thing with a lot of Gia’s pants from the previous year (and more because she has a tiny waist too). It’s a great way to save some money! Genius. Such a pain to pull out those boxes, but if it saves a trip to the store and the money spent I’m all over it. Thanks!